“I fear the government more than my fellow citizen, so I come down on the side of protecting free speech,” said commission vice chairman Donald F. McGahn II. WASHINGTON — The free charter flight for Mitt Romney campaign volunteers seemed like an open-and-shut case for the six members of the Federal Election Commission. A wealthy friend of Romney spent $150,000 to fly as many as 200 campaign volunteers from Utah to a fund-raising phone-a-thon in Boston. The three Democrats on the FEC agreed with the agency’s staff that the charter appeared to violate rules limiting such “in-kind’’ gifts to $2,600 per election. But the three Republican commissioners disagreed, saying Romney’s friend merely acted “in behalf of’’ Romney’s 2008 campaign — not the illegal “on behalf of” — and thus the flight was allowed. With that twist of legal semantics, the case died — effectively dismissed. The 3-3 deadlock was part of a pattern of paralysis that has over the past five years gripped the commission, the nation’s principal referee for federal elections. The FEC has often been the subject of criticism since its founding four decades ago. But the impression of weakness has escalated dramatically, as Republicans named to the panel in 2008, united in the belief that the commission had been guilty of regulatory overreach, have moved to soften enforcement, block new rules, and limit oversight. In essence, according to critics, the FEC has been rendered toothless, and at the worst possible time, when powerful special interests are freer than they have been in decades to exert financial influence on Washington politicians. The commission is taking up far fewer enforcement cases — down to 135 in 2012, from 612 in 2007. And those cases it does consider often go nowhere. 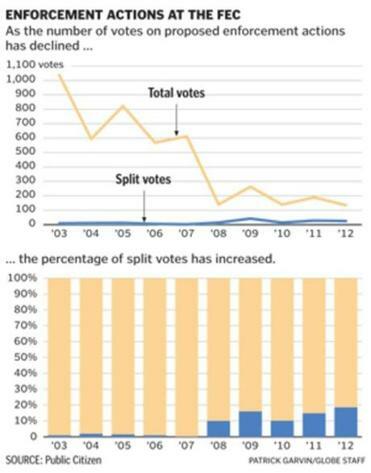 The frequency of deadlocked votes resulting in dismissed cases — like the case of the Romney friend’s chartered jet — has shot up, to 19 percent, from less than 1 percent, according to figures compiled by critics of its performance. The commission has also been hobbled by internal discord as it responds to the profound changes wrought by the Supreme Court’s Citizens United ruling in 2010, which opened elections to unlimited corporate spending. New disclosure rules designed to help voters see which monied interests are spending hundreds of millions of dollars in campaigns have been blocked. It has stood by as candidates and the new super PACs supporting them, which can accept unlimited amounts from individual contributors and corporations, have established increasingly intertwined connections. The story of how an agency went from being a model of good-government intentions to a symbol of broken Washington stretches across the nation’s capital, from the Congress that created the FEC and then stymied it, to the White House that failed to nominate new commissioners, to the Supreme Court that gutted campaign finance laws. Today, the agency is among the nation’s most dysfunctional federal entities, with leaders who rarely speak outside the confines of formal meetings, a staff of investigators who are routinely ignored, and a mandate that is rarely fulfilled. Expectations were greater when the Federal Election Commission was created in 1975, in the aftermath of the Watergate scandal. Confronted with evidence of illegal six-figure campaign contributions to President Richard M. Nixon’s reelection campaign, Congress recognized the need for an independent agency to investigate and audit campaigns. Supporters envisioned an aggressive, independent watchdog that would seek out violations of new campaign-finance rules designed to reduce the influence of money from special interests, said William Frenzel, a former Republican congressman from Minnesota who cosponsored the House amendment establishing the agency. But Frenzel and others say the design of the commission was flawed from the start. While putting a new cop in charge of the campaign beat, Congress kept a firm grip on who would lead the organization. The commission has six members, three Democrats and three Republicans, but it can take no action without the approval of a four-vote majority. Names of nominees for the panel’s six seats are recommended by Senate party leaders and sent to the White House to be nominated by the president, then confirmed by the Senate. The effect has been to inject partisan differences into the commission’s DNA, while increasing the probability that votes would end in deadlock. “It’s not working, and that’s how it was designed,’’ said Richard Briffault, a professor of law at Columbia University who has studied the commission. To maintain continuity, the agency is supposed to have staggered terms for its full-time commissioners, who earn government salaries of $155,000 a year. But battles over White House nominees during President George W. Bush’s second term had created an unusual situation at the Federal Election Commission in 2008 — four simultaneous vacancies, three reserved for Republicans, one for a Democrat. That presented the Senate’s minority leader — Republican Mitch McConnell of Kentucky, a staunch opponent of curbs on campaign spending — with a rare opportunity to fill three slots at once. 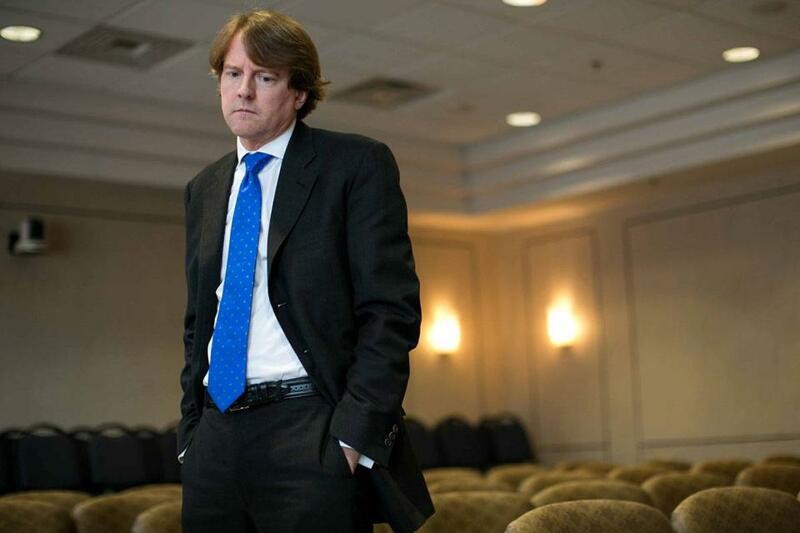 Of the three who were confirmed, Donald F. McGahn II had the most experience advising campaigns on election law and defending politicians and campaign committees before the Federal Election Commission. He was immediately recognized as the intellectual core of the new Republican team. And, as he confirmed in interviews with the Globe, McGahn arrived with a clear agenda: Roll back what he considered chronic “overreach’’ by the agency he had just been appointed to lead. McGahn was raised near Atlantic City, the nephew of a powerful Democratic New Jersey state senator who wrote the state’s casino laws. He and his family, he said, became Republicans during the Reagan era, disillusioned by the presidency of Jimmy Carter. Outspoken and a ready combatant over legal issues, he wears his hair a bit longer than is fashionable in Washington and plays rock guitar in a cover band, appearing at surfside venues in Delaware and Maryland. On matters of campaign finance, he is generally opposed to government interference and believes the Federal Election Commission for decades has unfairly trampled the free-speech rights of candidates, campaign contributors, and special interest groups. McGahn openly disdains what he calls “reform-industry lobbyists,’’ whom he claims are out to chill political speech with disclosure rules and restrictions on political advertising. McGahn came by these views as a private-sector lawyer working at a powerful Washington law firm, Patton Boggs, during the 1990s. He mentored under another Patton Boggs attorney, Ben Ginsberg, a well-known Republican who would become the campaign lawyer for both of Mitt Romney’s presidential elections. In 1999, McGahn vaulted to the post of general counsel for the National Republican Congressional Committee, the main campaign arm of House Republicans. He occupied that position for nearly 10 years. Critics contend that exploiting campaign finance loopholes was part of his job. During McGahn’s tenure, for instance, the committee gave $1 million to an organization called The Leadership Forum, which critics complained was part of a scheme to get around a 2002 ban on “soft money’’ spending by parties. An FEC complaint died after the Leadership Forum gave the money back to the National Republican Congressional Committee. McGahn refused to say what role he played in setting up the money transfer, saying he does not discuss client business publicly. He gained further public notice when he represented two political committees operated by former House majority leader Tom DeLay , a Texas Republican. DeLay gave up his powerful leadership position after he was indicted by a Texas county grand jury in a campaign finance scandal in 2005. When McGahn’s name was floated in 2005 as a potential FEC member, campaign finance watchdogs objected. They sought to use his own words against him, publicly highlighting a statement he made to a British researcher about the commission’s traditionally close ties to Congress. McGahn keeps a fuzzy fox hat on a shelf in his office, wry testament to his last laugh. 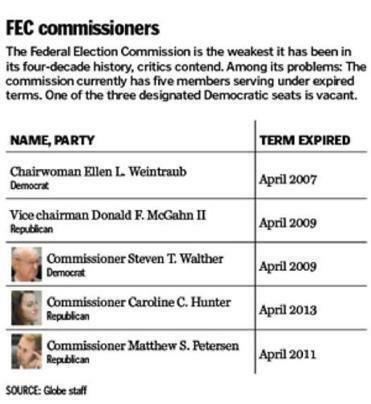 FEC chairwoman Weintraub sent a greeting to McGahn and the other new Republican commissioners when they arrived at FEC headquarters in the summer of 2008, well into a busy presidential election year. The commission — which has 375 employees and a budget of $66 million — had been unable to make formal decisions for the previous six months: With four vacancies, it was down to just two members. Weintraub, a Harvard-educated lawyer who earned her Washington stripes as counsel for the House Ethics Committee, was ready to get to work. 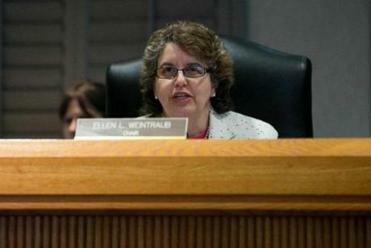 Weintraub received no response, establishing what she described as a pattern of the Republicans keeping to themselves. Any substantive discussion takes place in formal meetings. She noticed that the GOP members and their staffers even went to lunch as a group, huddling in a knot in the elevator lobby. Weintraub said she rarely has private conversations with McGahn, whose office is next door to hers. McGahn and his allies function as a unified block, united by party and ideology. That is a departure from the past, say longtime observers, when members more frequently crossed party divides, making it possible to get the four-vote majority necessary for the agency to act. The backlog of unfinished business has jumped because Republican commissioners raise objections to the most routine enforcement matters and audits, she said. The commissioners recently had 65 matters pending on their desks. Republicans grill audit staff and investigators over their reports, much of it during day-long executive sessions, behind closed doors. Many of those cases are routine. McGahn bristles at Weintraub’s depiction, including about his phone manners. “She doesn’t call me,’’ he said. “She has my number. She never uses it. McGahn said he refuses to get drawn into compromises on policy and enforcement with Democrats on the commission. Republicans on the panel did so in the past, he said, and it was a mistake. He cites Supreme Court rulings that have limited FEC regulations. “You can’t horse-trade when it comes to the First Amendment,’’ McGahn declared. McGahn cast himself as a champion of the little guy. He sides with individual politicians and campaign contributors who he says must navigate a maze of rules erected by “unelected bureaucrats’’ seeking to stifle speech and legitimate campaign activity. ■When Utah businessman Kem Gardner paid $150,000 for the charter jet that flew up to 200 volunteers to Boston, Democrats on the FEC said it was “not a difficult case’’ — Gardner had clearly bestowed an expensive in-kind gift to the Romney campaign — and voted to launch an investigation. But in the view of McGahn and the other Republicans, there was no evidence the Romney campaign asked Gardner to charter a plane. Thus, he was not acting “on behalf of’’ the campaign, they said. Case dismissed. ■McGahn’s preference for leniency also extends at times to Democrats. Consider the case of an operative at the Washington State Democratic Central Committee who was suspected of embezzling $65,000 and quietly returned the money. The operative signed a settlement agreement with the FEC, but the commission deadlocked, 3-3, and refused to accept the signed deal. McGahn said he saw the matter as a contract dispute, not a violation. Case closed, no finding. ■In a special congressional election in Louisiana in 2008, a conservative group based in Washington called Freedom Watch, largely financed by billionaire casino mogul Sheldon Adelson, directly targeted the Democratic candidate with attack advertising. But it did not disclose the identities of its contributors. The Federal Election Commission staff and Democratic members said the lack of disclosure was an apparent violation. McGahn and the other Republicans disagreed. They said contributors to Freedom Watch had not specifically requested that their money be used on those specific ads, in that specific campaign, so therefore no disclosure was required. Another enforcement case, fizzled. The sentiment is part of a philosophy of transparency that stood for decades at the core of the Federal Election Commission’s mission. The Supreme Court in its 2010 Citizens United ruling even cited the need for public disclosure as a counterweight to the unlimited corporate, union, and nonprofit spending on elections the court authorized in that decision. But current reality does not match the justices’ vision. The FEC’s disclosure rules for many types of outside groups contain major gaps, which have permitted a surge in secret spending. The sources of about $310 million in campaign spending in the 2012 election legally were not disclosed, up from $130 million in 2010, according to the Center for Responsive Politics, a nonprofit that tracks the flow of money in elections. Crossroads GPS, a nonprofit organization associated with Republican adviser Karl Rove, was the leader in spending money from undisclosed sources in the 2012 election, with $71 million. Campaign reform groups have passionately urged the Federal Election Commission to lift the veil on this activity by strengthening its rules, but McGahn and the Republicans have blocked such a move. “Surreal,’’ was how Weintraub described a hearing on the subject, after McGahn used a procedural objection to prevent her from grilling a US Chamber of Commerce lawyer on the chamber’s disclosure filings. McGahn’s opposition to disclosure is gaining popularity in conservative circles, notwithstanding the urging of the Supreme Court. McGahn contends revealing the identities of people who pay for political advertising has a chilling effect on political speech. “It’s what do you fear more. Do you fear the potential influence that money could buy on policy, which no one has ever proven or is very attenuated? Or the ability of the incumbent politicians to know who is criticizing them and retaliate? Advocates disagree strenuously, including a 23-year former veteran staffer of the FEC, Lawrence Noble, president of a nonprofit group, Americans for Campaign Reform. Noble spent 13 of his years at the FEC as the agency’s general counsel. He described McGahn’s position as “nonsense’’ and said the FEC does have legal authority to develop new disclosure rules. As Republicans have progressively weakened the commission, President Obama has come under fire for failing to nominate new commissioners as terms lapse: McGahn’s term expired in 2009, and Obama has been slow to nominate a successor. The president nominated a labor lawyer to fill a Democratic seat in 2009, but he was blocked by a bipartisan group of senators. Last month, Obama finally nominated a replacement for McGahn, whose departure may occur this month, while also nominating someone to fill a Democratic vacancy. A spokesman for Obama did not respond to requests for comment. The nominations are pending before the Senate. Even as he prepared to step down, McGahn last month was pursuing one last crusade: stripping Federal Election Commission staff lawyers of much of their authority to independently investigate cases. McGahn believes the commissioners themselves should assert greater control over investigations, as well as decide when the agency shares information with the Department of Justice. A key part of his proposal would prohibit agency investigators from reviewing candidate websites, YouTube, news articles, social media, and federal court records to help them determine whether a complaint has merit. The proposal has touched off yet another ideological battle within the FEC. The commission’s general counsel responded with an exhaustive memo, released last week, strongly defending the staff’s authority to investigate complaints. The wrangling continued Thursday, after Republicans on the commission won a delay of a public discussion on the matter — even though it had already been posted on a public agenda and attracted a meeting room packed with lawyers and other observers. McGahn and the Republicans offered no explanation for the delay, said Weintraub, visibly frustrated. Christopher Rowland can be reached at crowland@globe.com. Follow him on Twitter @GlobeRowland. Correction: Because of a graphics editing error, a chart accompanying an earlier version of this story gave the incorrect date for the expiration of Commissioner Matthew S. Petersen’s term. It expired in April 2011.